Trap Rock Troubles? – Surestrike International, Inc.
For your toughest Trap Rock and oversized applications turn to Surestrike International’s complete line of impact hammers. Reliable quality from a trusted and proven manufacturer for over two decades. 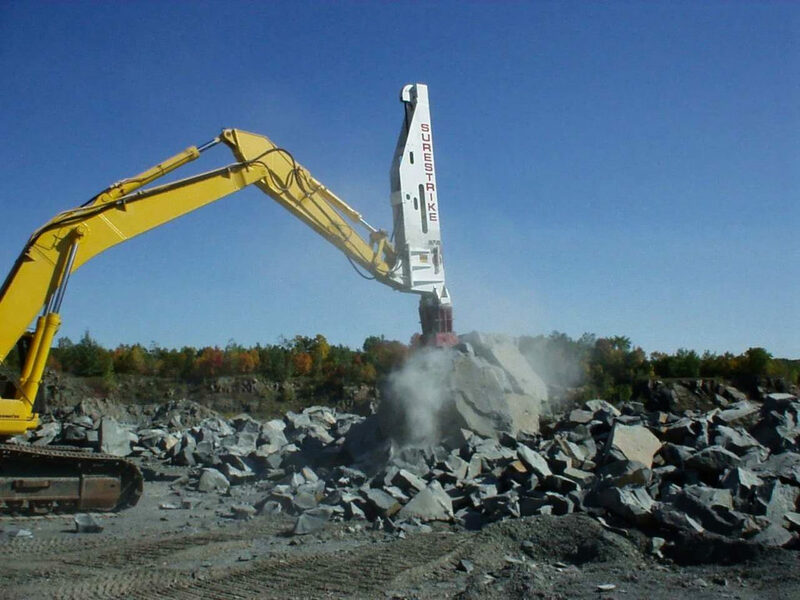 A Wisconsin quarry owner turned to Surestrike International when others struggled and successfully used the Surestrike impact hammer to break the oversize trap rock in their 100 year old quarry. The Surestrike impact hammer was excavator mounted and easily broke the 75,000 to 100,000 PSI compressive strength boulders that are made during the blasting process. The trap rock in this applciation was very hard with an LA rating of about 7.8. This can cause significant challenges for traditional hydraulic hammers. Previously, the quarry owner had used a 12,000 # drop ball/cross mounted to a crane for breaking the rock. This was a slow and inefficient process. The crane was slow to cycle and many times the ball/cross missed its target. When it did make a good hit, there was a significant amount of fly rock and sharp pieces that were driven into the ground. The sharp pieces proved to be very hard on the loader tires during the clean up process. The quarry owner had also tried many different types of hydraulic hammers in this application. Because of the hardness and density of the rock, not even the largest of the hydraulic hammers would efficiently break the rock. The Surestrike hammer provided high productivity and an efficient and safe operation to reduce the oversize rock. Additionally the Surestrike impact hammer was not producing the sharp pieces so the loader tire life was vastly improved. The operator found it easy to manufacture rocks of a desired size for their rip rap applications or to break the 8’ x 8’ rock into 24” – 30” minus to feed to the jaw crusher limiting their plugging problems.